I was pretty uninformed about the Ode'min Giizis Festival in Peterborough this week, but luckily Del Crary Park is very nearly my backyard. I sauntered over yesterday afternoon, and turned out again in the evening for some amazing performances. According to their website, the festival features "over 100 Indigenous artists, including musicians, performers, visual artists, writers, storytellers, artisans, and dancers," and runs for five days. I'm sorry I didn't get on it earlier, but I'm glad I caught as much as I did. I enjoyed David Maracle, Chaka Chikodzi, and Gabriel Ayala's act on downtown Hunter St., and the evening closer by the Resolutionaries was downright incredible. I'd heard rumours of a local marimba band, but now that I've seen 'em once I'd go again in a heartbeat. The Resolutionaries are led by Chaka Chikodzi, who immigrated to Canada from Zimbabwe in 2001. He's rounded up some fine local talent, including the surnameless (at least on the Internet) Anna, her brother King Julian, Howard Gibbs, and Wyatt Burton. They managed to fit on stage three marimbas, a drum kit, hand drums, electric bass, and even a dance ensemble at the front of the stage to warm up the crowd. I did my best to follow their example. 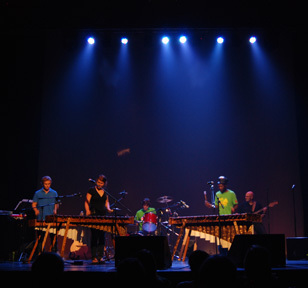 The sound of the marimba is purely musical, intensely rhythmic but with a melody that is simple and insistent. I'm fascinated by instruments that involve the whole body and was quite taken by the way the musician's vigour translated into a precise, tight groove. As corny as the term life-affirming can be, the Resolutionaries come by it honestly. Their music is not just up-tempo - making something this joyous is a real feat.